Sizzling Scorpions Slot Machine - Casino Answers! 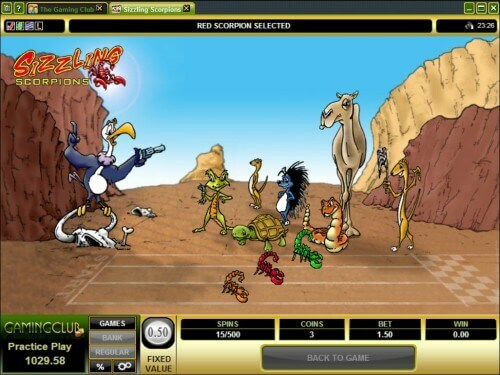 Sizzling Scorpions is a 3-reel, 1-line classic slot machine developed by Microgaming, featuring a bonus game. You can play the Sizzling Scorpions classic slot machine at Bovada. The Sizzling Scorpions slot machine has a fixed coin value of $0.50. You can bet 1-3 coins per spin on the Sizzling Scorpions casino game. The maximum bet on Sizzling Scorpions is $1.50 – a low betting range that is ideal for casual players. To play the Sizzling Scorpions classic slot, select your bet and press the “Spin” button. To play the maximum bet (highly recommended), press the “Bet Max” button. 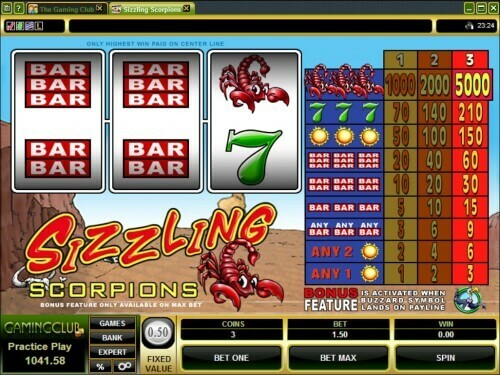 The Scorpion is the top-paying symbol on the Sizzling Scorpions classic slot. If you land 3 Scorpion symbols on the payline, you will win the 5000 coin jackpot. The second highest paying symbol is the Seven symbol, which can pay out up to 210 coins. You can win 5000 coins on Sizzling Scorpions when you sign up today at Bovada! The Sizzling Scorpions slot machine has an autoplay mode with advanced settings. To access Sizzling Scorpions’ autoplay feature, hit “Expert” and you can play 5 or 10 autoplay spins or hit the “Auto Play” button to open up advanced settings. You can set the number of spins (5, 10, 25, 50, 100, 250 and 500), number of seconds between spins (0, 0.25, 0.50, 0.80 and 1.50), stop once all spins are complete, stop when jackpot is won, stop if a win exceeds or equals ($25, $50, $100, $250, $500, $1000 and $2500), stop on any win, stop on bonus game and stop if credits increase/decrease by ($25, $50, $100, $250, $500, $1000 and $2500). You can stop the autoplay mode at any time. The Sizzling Scorpions slot game has a cool bonus game along with a good top jackpot. It’s also a great slot for the low rollers out there as all you need is $1.50 and you can win the top payout and trigger the feature. You can play Sizzling Scorpions now at Bovada! Can American players play the Sizzling Scorpions slot game for real money? No, but American players can play at the USA-friendly Win A Day Casino. Can you play a free flash game of Sizzling Scorpions? Yes, you can find Sizzling Scorpions on page 9 of the Bovada flash casino. You can play it for free in practice play or for real money. Update your version of Adobe Flash Player if you have any difficulties.